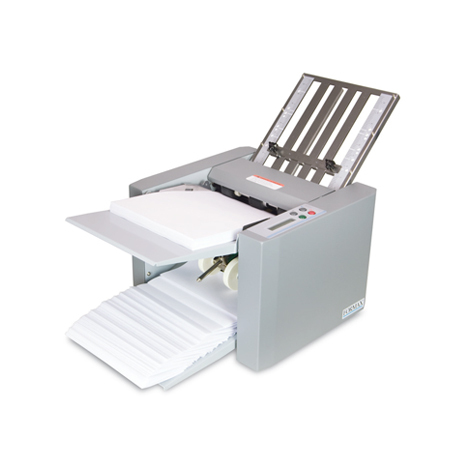 The FD 314 Office Desktop Folder provides an economical solution for low-volume folding projects. It combines a compact footprint with push-button controls, so it's simple to use, right out of the box! Fold plates are clearly marked for four common folds - letter, zig-zag, half and double parallel - and can be easily adjusted for custom folds. With a three-tire drop-in feed system, it processes 11” and 14” paper at speeds up to 7,700 sheets per hour, and offers a hopper capacity of up to 250 sheets. Over 70 years we manufacture mail processing machines used for postal and financial administration, trade, industry and commerce services. Our fully developed Swiss quality products are the result of decades of development and production experience in mail processing machines!